The Iron Man Traverse was one of the first problems I worked for up at the Buttermilks, and it was a landmark in my bouldering as I’m sure it has been for many others. 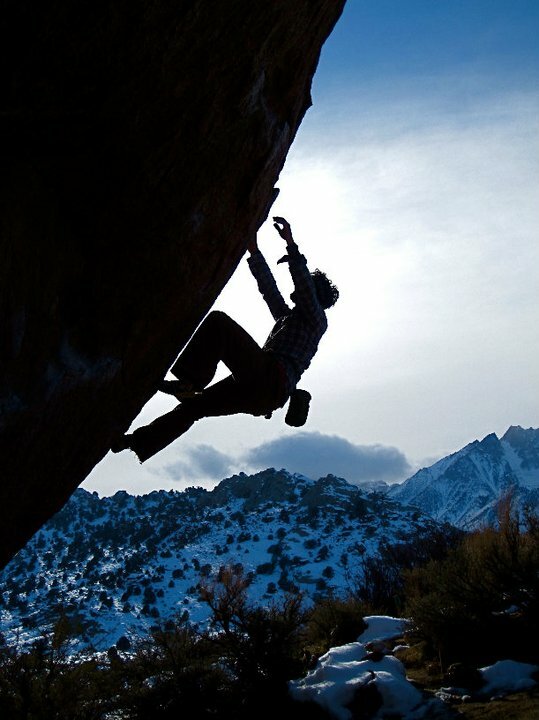 Beginning at a wide, flat rail, the climber moves right, following the rail as it thins down to fingertips. Nearing the end, as the climber tires, the rail peters to nothing, forcing a withering slap to a sloping lip before a tricky mantel onto the summit. 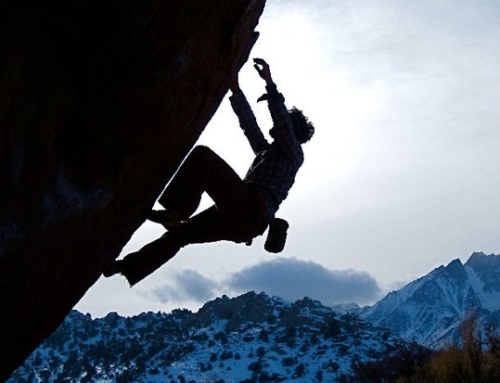 Above: The Iron Man Traverse, Buttermilks, image by Dan Brayack, Brayack Media. This compelling problem, in the middle of the main area at The Buttermilks must be one of the most often-tried problems of its grade anywhere in the world. So what is the story behind this line? 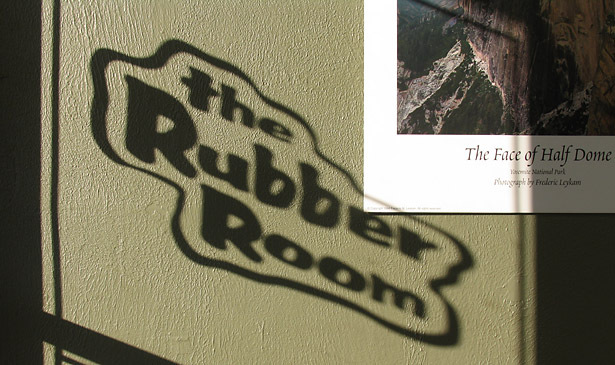 Getting the ball rolling by climbing and naming this popular classic was our very own climbing-shoe re-sole master Tony Puppo of The Rubber Room in Bishop. 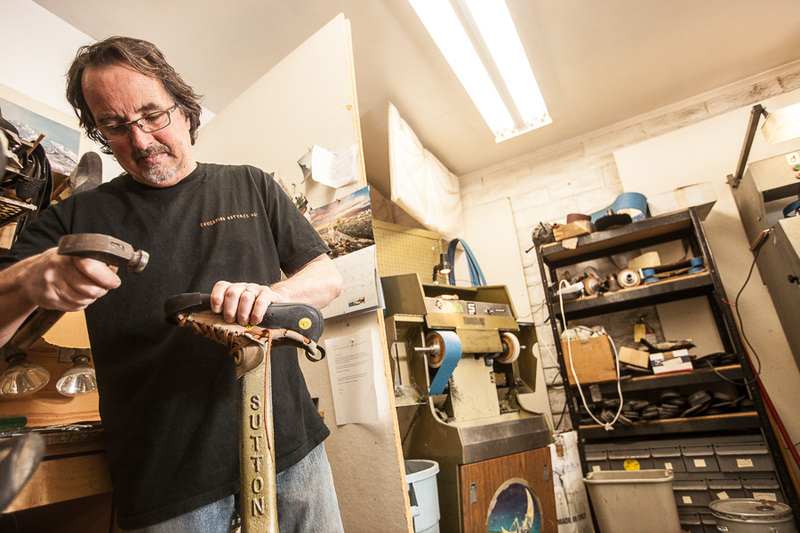 Tony grew up in Santa Barbara, but in 1976, after attending college in Long Beach, he moved to Bishop to be nearer the mountains, nearer to Yosemite Valley and Tuolumne Meadows. He spent his time working various jobs and finding time to climb. Nevertheless, Tony did name a couple of his boulder problems including one fun problem for which you begin by crawling into the large hueco at the base of the rock—really a lie-down start! Tony was clearly a man ahead of his time. 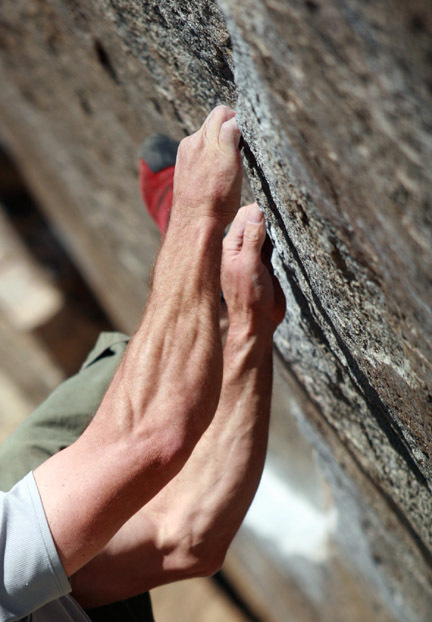 But things were changing fast in the climbing world. Tony remembers a moment of inspiration when he saw a magazine cover showing John Long climbing one of John Gill’s testpieces at Pueblo, Colorado. 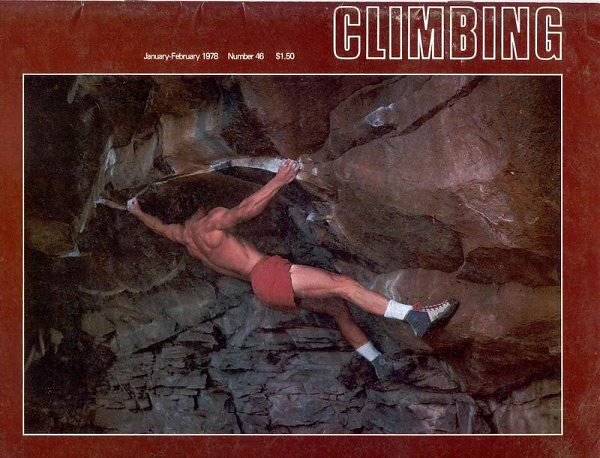 It was January 1978, long before the internet: Climbing magazine was one of the only places to read about climbing; it cost a buck-fifty, and on the cover was this superhero in running shorts pumped up like a muscle-mag stud burling across this mythical masterpiece of bouldering esoterica, The Ripper Traverse. Long’s article (Pumping Sandstone) validated Tony’s interest in that horizontal rail up at the ‘Milks, clearly marking it as a worthy objective and he set out to climb it. Later that year, after numerous visits, he finally achieved his goal. Pondering for a while over a name for this singular line, Tony called to mind that inspirational photograph of Long, arms spread on The Ripper, and named it The Iron Man Traverse. The problem was near perfect, and the name stuck. Needless to say the Iron Man immediately became a must-try testpiece for locals and visitors alike. Meanwhile, some years later, Tony moved on to manage the resoling business at Wheeler and Wilson’s, later Wilson’s Eastside Sports. He astutely hired his wife-to-be, Nan, as a cobbler—you’ve got to wonder how that interview went! Then, in 1999, a few years later, James Wilson made an agreement with Nan and Tony Puppo to split the resoling operation from the retail store and together they put the belt-sanders, work benches, and shoe presses onto dollies and rolled them over the pedestrian crossing across Main Street, through the parking lot, and in through the front door of their new business: The Rubber Room. It is an innocuous little place facing the mountains just south of Joseph’s “Bi-rite” Market, but during peak season 300-plus climbing shoes a month will pass through the building. 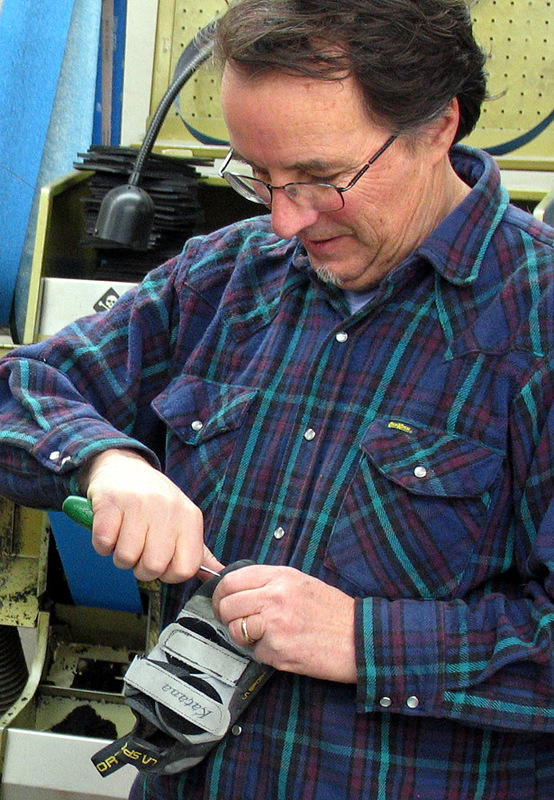 Check out the antique 1940s boot-stitching machine handed down through generations from a cobbler known only as “Tennessee.” Tony himself has spent over 30 years resoling shoes, living a life surrounded by sticky rubber as he and Nan built the business into one of the premier resoling operations in the country. All I can say is it’s a good thing Tony named that amazing problem up at the ‘Milks before he took up the business: The Rubber Man Traverse just wouldn’t have the same ring to it. 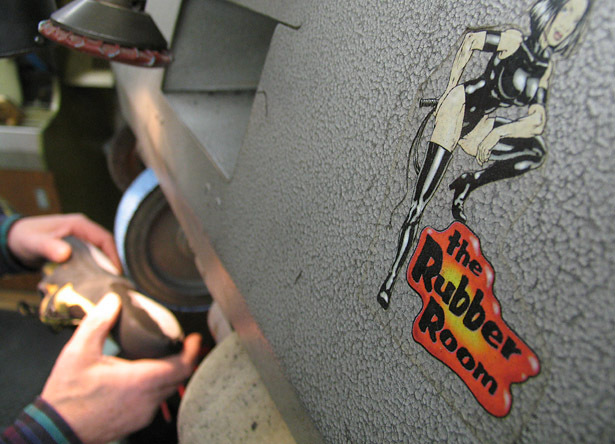 Above three images: Tony Puppo at work at The Rubber Room, Bishop.